It's almost hard to grasp that Tim Cook has been Apple's CEO for just over one year, considering the palpable changes he's already brought to the company. 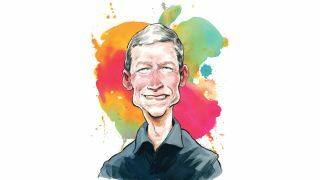 Though he says "lots of little things" are different in a Bloomberg Business interview out today, with some executives gone, others in expanded roles, and a company that is, as Cook said, aiming for better transparency, this is definitely not Jobs' Apple any longer. The CEO, considered robotic by some (he doesn't think that's true), also talked to NBC's Brian Williams in an interview that will air tonight. In both bits, he dropped some bombshells like "insourcing" Mac production and hinting at an Apple TV set finally landing in living rooms. While these are headline stealers, Cook touched on a number of subjects in his Bloomberg interview that raised our eyebrows. Perhaps the most noticeable alteration to come Apple's way in the last year is the ousting of iOS' chief Scott Forstall and retail head John Browett, with the departure of the former (who won't be gone for good until next year) the biggest change. The move, Cook told Bloomberg, was intended to take Apple where it needs to go. "The key in the change that you're referencing is my deep belief that collaboration is essential for innovation - and I didn't just start believing that," he said. "So the changes - it's not a matter of going from no collaboration to collaboration. We have an enormous level of collaboration in Apple, but it's a matter of taking it to another level." One juicy bit from Cook's Q&A is that the Cupertino company apparently has some ambitious wireless plans ahead, a goal it can't meet without its new Senior Vice President of Technologies Bob Mansfield at the helm. "We've got some really cool ideas, some very ambitious plans in this area," Cook revealed. "And so it places him leading all of that." Samsung, it's well known by now, is an Apple supplier yet one of its biggest competitors and most scrappy legal opponents. That triple relationship is uncomfortable, Cook said. "Life is a complex thing somethings, and yes, it's awkward," he acknowledged. "It is awkward. I hate litigation. I absolutely hate it." Then why continue to fight? "For us, this is about values. What we would like, in a perfect world, is for everyone to invent their own stuff. "We love competition. But we want people to have their own ideas and invent their own stuff. So after lots of trying, we felt we had no other choice." Cook was asked point blank what sets Apple's tablet strategy apart from Samsung and Microsoft's, and the CEO returned to his favorite theme of coalescence to answer. "Again, if you look at our North Star, we're focused on making the best products, so ours is very product-centric," he said. "We're also marrying hardware, software and services. "If you think about Android, it's more like the Windows PC model. The operating system comes from company A. Company B is doing some integration work, and maybe the services come from yet somewhere else. "I think we know the kind of customer experience that produces." Cook has played with Microsoft's Surface, an unspecified Galaxy device (or two) and other non-iOS machines, and the experience wasn't pleasant. "[Some] of these are confusing, multiple OSs with multiple UIs," he said. "They steer away from simplicity. We think the customer wants all the clutter removed." What does Cook think Apple does better? Tablet-optimized apps, for one. And staying away from netbooks, which were "flimsy products with crappy, cramped keyboards."